The Internet can be a dangerous place — particularly for minors. You can use the Content Advisor in Internet Explorer 8 to protect kids (or anyone else) from inadvertently stumbling across something you don’t want them to see. 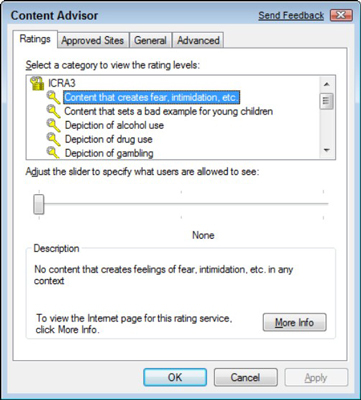 In Windows 7, the Parental Controls have been scaled back to the point where they have little impact on what the person views during their allotted time. You can use the Content Advisor to limit the online locations that the computer can visit to help protect your kids. Open IE and choose Tools→Internet Options. Click the Content tab to display it. Click the Content Advisor Enable button. Click the Settings button. Click the Ratings tab, click a category and move the slider to set the level of content you wish to see. For each category (such as Depiction of Drug Use), you can choose one of three site screening settings: None, Limited, or Unrestricted. Repeat Step 3 for each of the categories. To control access to specific sites, click the Approved Sites tab. Enter the name of the site and the level of control. You can choose Always or Never. Always allows users to view the site, even if it’s included in the Content Advisor screening level you’ve set. Never means that nobody can visit the site even if it’s acceptable to Content Advisor. When you finish adjusting your settings, click OK twice to save them. Rather than trying to determine what sites are safe by yourself, you can use one or more pre-existing ratings systems. Click the Rating Systems button on the General tab of the Content Advisor Settings dialog box. Choose a system already shown there. To use more than one system, click Add; then choose another system to apply. If you want to view sites that you don’t want others to see, go to the General tab of the Content Advisor dialog box. Select the Supervisor Can Type a Password to Allow Viewers to View Restricted Content check box and then click Create Password. Enter a password, confirm it, and then enter a hint and click OK. Now you can get to any restricted site by using this password, as long as you’re logged in as a system administrator.